This painting on canvas had been pasted to a wall. 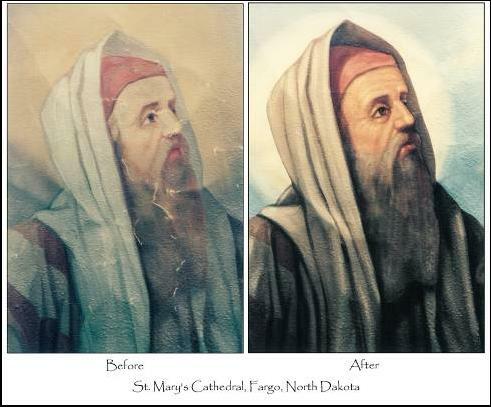 It was taken out of a church that was being closed and moved to St. Mary’s Cathedral in Fargo, North Dakota. As you can see it was in poor condition. I cleaned and repaired all the damage in my studio then installed it at St. Mary’s. After installing the painting in the new spot in the Cathedral (high up in the ceiling) it was decided that the Prophet was too hard to see. To correct this problem I sharpened up the figure so it separated from the background and increased the contrast through the whole figure.